All American Landscape & Masonry is one of Rhode Island’s most reputable landscaping companies offering comprehensive lawn care services. We cover the areas of Newport, Portsmouth, and Middletown, and we handle both residential and commercial properties. Since our company began its operations, we have maintained numerous lawns in typical neighborhood to expansive yards in upscale communities. In all our projects, we make it a point to fully understand what exactly our clients need. This way, we form a lawn care plan that covers all their concerns and renders their expected outcomes. If you want only experienced professionals to take care of your lawn, then contact us soon. Why Hire Professionals for Your Lawn Care Needs? While you can save money or have bonding moments with your family by taking care of your lawn on your own, you can’t always expect great results. As it is, there are special tools and equipment required for specific lawn care tasks that only established lawn and landscaping companies have. Additionally, you need experience and the right skill to ensure a lush and stunning lawn. Mowing tasks, for example, should be done on specific periods and with ideal frequencies. 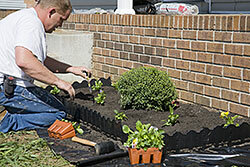 Application of fertilizers is also best left to professionals to get the best results. Moreover, you should have access to premium supplies and materials to ensure the health of your turf and other plantings. And when it comes to providing professional lawn care services to property owners in Newport, RI and other select cities, All American Landscape & Masonry is the name that you can rely on. Our offered lawn care services practically cover every possible concern that clients like you may have. We provide mowing and trimming for your turf and other plantings. We perform these tasks systematically and based on ideal frequencies. We also render weed and pest control, with focus on using only products that won’t harm the environment. Moreover, we offer aeration, dethatching, yard clean-ups, fertilization, as well as overseeding and resodding. All of these tasks are handled only by our team of experienced and trained personnel, so you can expect only positive results. 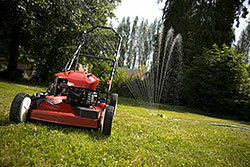 We can also perform other lawn and landscape maintenance services. Just let us know your specific needs, and we will send our personnel to your location. For years, we have been providing outstanding lawn care services to commercial and residential property owners in the state. It is always our goal to make every project an opportunity to help our clients have stunning lawns that they can be proud of. We also take care of residential lawns and commercial areas with the same level of dedication and attention, making us well loved by our clients from Newport and surrounding areas. We also have the needed tools for the various lawn care jobs, so you can expect fast project completion and outstanding results. From hand-held tools to riding mowers, hedgers, spreaders, dethatchers, and aeration tools, we have them in our inventory. If you want a well-manicured lawn all year round, hire All American Landscape & Masonry. Call us today at 401-619-5296, or visit our office at Middletown.